Relyence Fault Tree supports a wide range of logic gates and event types for building complete fault trees. Relyence Fault Tree provides a user-friendly diagramming interface that enables you to quickly build your fault trees with ease. 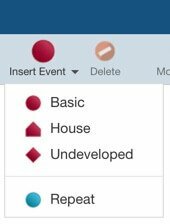 Select your gates and events and use our efficient interface to add them to your diagram. Relyence Fault Tree then optimally lays out your tree, auto-aligns, auto-connects, and adds color and graphics to enhance your diagram. The Relyence Fault Tree Diagram Editor does the work for you so you can concentrate your efforts where they are most effective: on your risk assessment activities. In order to model various types of interactions, a wide variety of gate types are supported. Events are the basic building blocks for fault tree analysis. Relyence Fault Tree supports an extensive array of input models. In Fault Tree analysis, all events are assumed to be statistically independent. However, in some cases, failure events may result from a common cause triggering multiple failures. You can account for this by using Common Cause Failure (CCF) Groups in Relyence Fault Tree. CCF events are simultaneous failures of identical components due to a common cause. 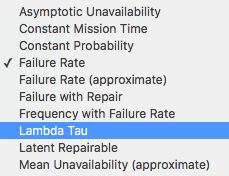 In Relyence Fault Tree, you can directly enter your CCF Groups using the CCF Group definition interface to describe which events comprise the group and the associated input model parameters. You can also directly add events from your Fault Tree diagram to a CCF Group. Relyence Fault Tree enables you to define Common Cause Failure (CCF) groups in your fault tree analyses. Relyence Fault Tree enables you to define disjoint events in your fault tree analyses. When modeling your system using Fault Tree Analysis, there are times when two events are mutually exclusive. For example, a resistor cannot fail open and fail shorted at the same time. In Relyence Fault Tree, you can model this condition through the use of Disjoint Event Groups. Events that belong to the same Disjoint Event Group cannot fail at the same time; therefore, if one event in the group has failed, none of the other events in the group can fail. In Relyence Fault Tree, you can use the Disjoint Event definition interface to define your Disjoint Event Groups and identify which events are included in the associated group. You can also add an event in your Fault Tree diagram to a Disjoint Event Group.